Virginia Eifert (see yesterday’s post) wrote this article in 1945 for Audubon Magazine. The magazine reprinted the article in January 1973, as part of its 75th anniversary issue, seven years after Virginia died. I’ve only just turned 16, but this is one of the most powerful, beautifully written, and important articles written about the necessity of bird conservation, and why now more than ever it is vital. If you’re in Canada, as I am, this article is just as applicable — add “North” in front of America/n each time and it’s just as true. Virginia Eifert lived through a great deal of bird destruction. When she was born in 1911, it would still be another two years before the U.S. Congress would pass the Weeks-McLean Law, what we now know as the Migratory Bird Act, which outlawed market hunting and the interstate transport of birds. Virginia was three years old when the last Passenger Pigeon died, and the last captive Carolina Parakeet died when she was seven. The last confirmed live sighting of an Eskimo Curlew came three years before her death in 1966. While we now live at a time when Passenger Pigeons, Carolina Parakeets, and Eskimo Curlews are only museum exhibits, Virginia knew that these birds had been alive and abundant only a short while earlier. She saw what had happened to them at the hands of humans. Special thanks to Virginia’s son Larry Eifert, for giving me permission to reproduce this wonderful article in its entirety here. They were here when we came, the birds which are a part of the American picture. They watched the cabins going up in the clearing at Plymouth, knew the secret of the lost people of Roanoke, clung in wide-eyed silence in the woods during the battles for freedom, moved out when cities grew, moved back again when gardens and bird pools and feeding stands said “welcome” and meant it. These birds are as much a part of America as its trees, its plains, its waters, its history, its shores, its hills, yet they are only as permanent as we choose—only as permanent, in fact, as the trees, the waters, the soil itself. They all are linked in the great picture of the American whole—a picture which is determined by the preserving or the squandering of the land and its inhabitants. We began badly. Humankind in the early days knew nothing of conservation. Here before us was a huge and boundless land; its trees, birds, and other wildlife were too much present. Back from the shores stretched the magnificent, terrifying wilderness. Where there were trees, there was danger; it was an ancient fear. The instinctive thing to do was to clear the land. As the American trees burned, the woods birds which had lived there died, or departed to other places, or adapted themselves to changed conditions. Cut down the trees, kill off the animals, shoot the birds—they’re fair game. That was the common opinion for a great many years, while the inheritance of the future grew less and less as the principal was squandered. In those days wildlife was looked upon as something undesirable, slightly disgraceful, a blot on civilization. So went the cormorants and gulls and terns from the East Coast nesting colonies—these birds ate fish and the fish were ours. Rose-breasted grosbeaks and waxwings and many more were shot because they ate fruit, or peas, or corn. The incredible numbers of the passenger pigeon provided great sport in knocking them down out of tree or sky. Then they were gone. Eskimo curlews, piping plaintively, came down out of the sky and covered the prairie with their numbers; they were netted, trapped, shot. Then they, too, were gone. As lakes and swamplands in the Middle West were drained, the waders, shorebirds, and ducks departed elsewhere or died. Everywhere, small boys were permitted to shoot birds; it was what small boys were expected to do. When men woke suddenly to what was happening to these things that always had been part of the American picture, the situation began to change. It took a long time for the realization to take effect, and the battle is far from being won even now. Still, as there never were a hundred years ago, there are millions of acres of land set aside for the use and protection of birds, sanctuaries with their armed and conscientious wardens. There are hundreds of bird clubs in America, united in the cause for birds, and bird-shooting by the young is not condoned. Laws now protect birds that once were considered useless, worthless, and to be exterminated as soon as possible. Protection has come and if it is not yet quite enough, still it is better than before. If these things had not come to pass when they did, America by. this time would have lost a vital, singing part of its personality. For in its birds lies the story of America. Perhaps no region would be emptier without them than the ocean shores. The voices of gulls are tuned to the sounds of waves; there is a wildness among seabirds which belongs to the temperament of the sea. The tide beach, the salt marshes, the bright sky, the veils of fog, the fish wharves, the edge of foam—birds belong here. New England must have its sanderlings on every shore, must have herring gulls on the red rocks of Scituate and on the whitened roofs of fishhouses from Passamaquoddy Bay to Provincetown. New England is hermit thrushes singing in balsams at dusk along the Androscoggin; it is a Blackburnian warbler flashing like a flame across the Mohawk Trail and disappearing into the birches; it is a phoebe nesting in a crevice on the Great Stone Face. Picture of a Phoebe (and Crested Flycatcher) from the 1920s “Bird Guide” used by Virginia, with her notes. Used with permission from Larry Eifert. Birds—they are meadowlarks singing in the rain at Gettysburg, and canvasbacks on Long Island Sound. They are willets that fly down Hatteras from Currituck to Ocracoke and back again; kingfishers that sit all day among cypresses of the Dismal Swamp. They are the loggerhead shrikes of the peanut fields and black vultures over cotton country, and laughing gulls above the battlefield at Yorktown. Picture of a Belted Kingfisher (and Black-Billed Cuckoo) from the 1920s “Bird Guide” used by Virginia, with her notes. Used with permission from Larry Eifert. There always must be a pelican on every post along the Southern shores, black skimmers flying in yapping crowds, royal terns over the paint-blue waters of the Gulf where porpoises leap in the sun, ibises in the Everglades and a snakebird sunning its wings on a palmetto tree. There must be a cardinal in the grapefruit grove, a pileated woodpecker in the Southern forest. These all are the South, they and the egrets that were saved from extinction by sanctuaries in the swamps, on the coastal islands, along the mangrove shores. For when the South became sanctuary-conscious, it made possible the keeping of these things that were so much a part of the scene that to find the South without them was unthinkable. The sanctuaries brought back the great white heron and the pink spoonbills that were almost gone and whose return even yet is not complete. The salvation of the ivory-billed woodpecker also is still going on, perhaps a futile attempt to keep forever in the swamp wilderness a sight of this great bright bird. By protecting birds in the South, we have protected migratory birds that nest throughout much of the rest of the country. An assurance of safety not only in their nesting areas but in their wintering grounds has helped tremendously in keeping them part of the picture of America. Birds are inseparable from its vivid whole. Without them America would be lost, a nation defeated, deprived of its inheritance handed down from a sometimes careless past. They are the Carolina wrens along Daniel Boone’s Wilderness Road, and a raven on Mount LeConte; they are the crying of whip-poor-wills in the hill woods of New Salem where Lincoln used to live; they are ten thousand wintering mallards on the lakes of the Illinois, and an eagle flying over Starved Rock. They are snow geese flying down the Mississippi Valley, and the voices of the Canadas against the stars. These birds are there because of the protection that came in time, protection that extends from the breeding grounds of Canada and northern America to the wintering grounds of Texas. It is a protection which must not be relaxed. 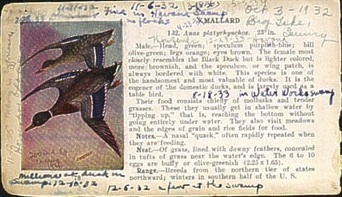 A Mallard, from Viriginia’s 1920s “Bird Guide”, with her handwritten notes. Used with permission from Larry Eifert. Westward as the landscape changes, the bird picture changes, and sometimes both have been threatened so dangerously that today there might be no more birds on the great plains and in the mountains and drylands. For there came drought and a wind that picked up the dessicated soil that had been plowed too well and not always wisely. The dust clouds swirled eastward and the Dust Bowl grew so fast that the shrieking gray and yellow kingbirds of every dusty cowtown and cottonwood went away in silence or died. The great plains might have lost their birds, but the end of the drought and the reclamation of dust lands came in time. The turn came in time to assure the westward traveler the sight of birds which ever afterward will stand associated with the great lift of land and the surge of the Rockies, with wheat fields and prairie dogs. Where a great sky arches above the pale yellow acres of Kansas wheat, and sky, and a flat white road—the lark buntings become a symbol of land safety, symbol of the stability of the soil. Black and white buntings mean rooted plains-buntings in the wheat, a Swainson’s hawk on every post, a dickcissel chanting, the-throaty song of a western meadowlark along the singing rails of the Union Pacific, and western kingbirds shrilling and fluttering wherever there is a perch. Their presence means that the restless earth of the plains has been anchored again, that the soil has stopped blowing and there are green things, that streams flow again and the cottonwoods are alive. There are nesting places, and there are birds. The equation is as simple as that, and it is as easily upset. It could have been seriously upset in the Western mountains where fires, overgrazing, erosion, and careless lumbering endangered life from the high country to the foothills, but national control helped establish the life balance again. Consequently there still are birds in the mountains, birds that are part of the high, clear, crystalline, unreal atmosphere of the peaks and passes. The Rockies today still mean white-throated swifts cleaving the air on a bright morning, mountain bluebirds bathing in an icy stream that runs through a purple meadow, the harsh cackling and laughing of magpies in a pine, the chortle of Clark’s nutcracker discovering a camper’s unguarded sandwich, the twitter of house finches among the red rocks. There still are ptarmigan on the Continental Divide where the white goats live, and red-shafted flickers on the western slope. These must always remain—these and the Steller’s jay screeching in the pinyons, the sage hen in the simmering badlands, the violet-green swallows nesting in hordes along the cliffs of the mad Colorado. There always must be avocets and stilts in the Utah marshes, white pelicans at Great Salt Lake, western grebes “walking on the waters.” Yet not long ago drainage threatened the Western marsh birds; egging and wanton killing were exterminating many colonies, from the Bear River marshes to the rocks along the Pacific. But again protection, in the form of restricted areas, national parks, sanctuaries, came in time. The bird rocks of the Pacific were declared out-of-bounds; the colonies on the mainland began to increase again. The marshes and tule lakes regained much of their former abundance. It came in time—this is the great singing voice of America, exulting. Not in time to save the Eskimo curlew and the passenger pigeon, not in time to save the heath hen and the great auk, but in time to save those others that might have followed. The birds which remain now multiply to perpetuate the picture of America. Here is positive proof of the new “goodwill toward birds” which more and more prevails. Their continued presence in our land is an assurance that among Americans there is a new tolerance, that there is a growing understanding of the part birds play in the economic and esthetic future of America. Today more people than ever before realize the significance of the bird in the landscape and derive from it a very real spiritual and intellectual pleasure. The bird is an assurance that life still is good, that in spite of menace there is confidence, that in spite of change there is adaptation, that in spite of death there now is life. Our rescued birds are the symbol of a growing America. 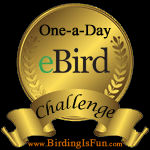 This entry was posted in Birding, General Birding, Nature and tagged These Birds Are America, Virginia Eifert. Bookmark the permalink. This is a wonderful article Charlotte!